The Seattle Art Museum has a long-held motto: We are all in this together! Presenting great art and inspiring programs takes a dedicated team, tireless volunteers, and passionate supporters. Each time I hear these words, I think about my dear friend, Nancy Delaney Alvord, who passed away in December. Nancy thought about the people behind the scenes. Shortly after moving to Seattle in the early 1960s with her husband Ellsworth C. “Buster” Alvord, Nancy began her SAM service as a volunteer. After becoming a Trustee a decade later, she created a Volunteer Committee—giving those who contribute their time a voice at the table. She also played a major role in establishing and funding SAM’s annual Volunteer Soiree and staff holiday party; a chance to thank the people who work so hard to make SAM’s programs possible. Always thinking of the bigger picture, it was Nancy who first convinced the SAM Board to adopt an aggressive membership recruitment program, knowing that great museums need the support of their communities to thrive. This paved the way for SAM’s move downtown in 1991 and a membership base which now includes over 50,000 local households. And it was at Nancy’s home in 1985, where a group of women first gathered to create the Seattle Art Museum Supporters (SAMS)—an organization that has raised nearly $7M to support exhibitions and educational programs. Together with Buster, Nancy was an instrumental supporter of every major SAM initiative, from the first remodel of the Seattle Asian Art Museum in 1974 (where the boardroom is named in their honor); to the move downtown and its later expansion. In appreciation for her decades of commitment, Nancy was both awarded the Dorothy C. Malone Volunteer Award, and ultimately named an Honorary Trustee, a lifetime designation. Outside of SAM, countless organizations were the beneficiaries of Nancy’s time and incredible generosity. She broke barriers becoming the first woman elected President of the Seattle Repertory Theater board; she was a Founding Director of the University of Washington Foundation; fueled by her interest in psychology, she founded the local chapter of the C.G. Jung Society; and she was a strong supporter of the ACLU. 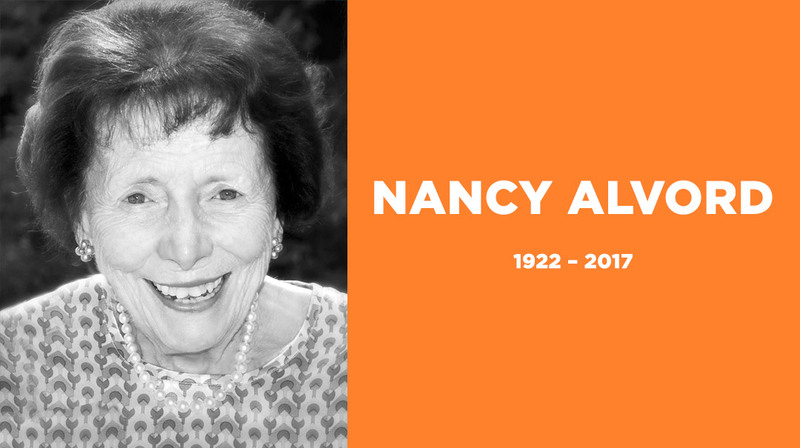 At SAM, and throughout our community, we will all miss our friend—our champion—Nancy Alvord. Photo: Nancy Alvord, photo courtesy of the Alvord family.